Today the new marks blend just right; random and comfortable, settling nicely beside leftover lines of magic marker and a significant scratch. Hours of homework, art projects and even the claw marks of an overgrown puppy, remain. Left behind for me to see and recall. A decade of living and raising children embedded in that table. Is it possible, that weathered and lived-in were more my style all along? Putting down his fork, he abandons the beat. His face skeptical and focused on the bowl before him, he asks, “Mom is a mushroom a fruit or a vegetable?” I continue on, making my rounds. Reaching and pouring, filling cups. Milk tumbles into his glass. Now finished, I slip into my seat and smile his way. Eyes wide and so blue, boy two waits for his answer. Hands fold. Heads bow. Thanks is given. For a moment our house is quiet. “It’s not a vegetable”, I reveal interrupting the silence. “It’s a fruit.” The fruit of what, I do not say. “I thought for sure it was a vegetable”, he mumbles not quite under his breath. My son returns to squirting ketchup on his baked potato. The unknown placed before him, now categorized, is less offensive; clearly less interesting. Realizing that some things just take a lifetime of living to be fully appreciated, I switch gears and tell my son the story of his mother’s middle name. The one she didn’t always like. And about the man whose name she carries yet never met. Who five generations ago walked the oak forest foraging the hidden places for sheep’s head mushrooms. Those he used in a traditional soup made for his daughter on a Christmas Eve or an Easter afternoon. A childhood favorite lost for a while but reclaimed when stirred by a granddaughter’s new recipe find. I go back to sipping my soup breathing deep the smells of dill and paprika confident knowing that if my son never eats a mushroom in his life, someday he too will be warmed by the distant memory of a once untold tale shared with someone loved. This soup is a real treat. It comes together quickly but you would never know that by the way it tastes. It oozes luxury, yet still manages to be a bowl full of comfort. The tamari intensifies the earthiness of the mushrooms in a way I had not encountered before. The dill and paprika are brilliant together. And the touch of lemon perfectly balances the richness of the sour cream. I serve it simply with a loaf of hard-crusted bread. But maybe you’d prefer to ladle it over a pile of egg noodles, goulash-style. I bet a little wild rice stirred in (my Dad’s suggestion) would be terrific too. 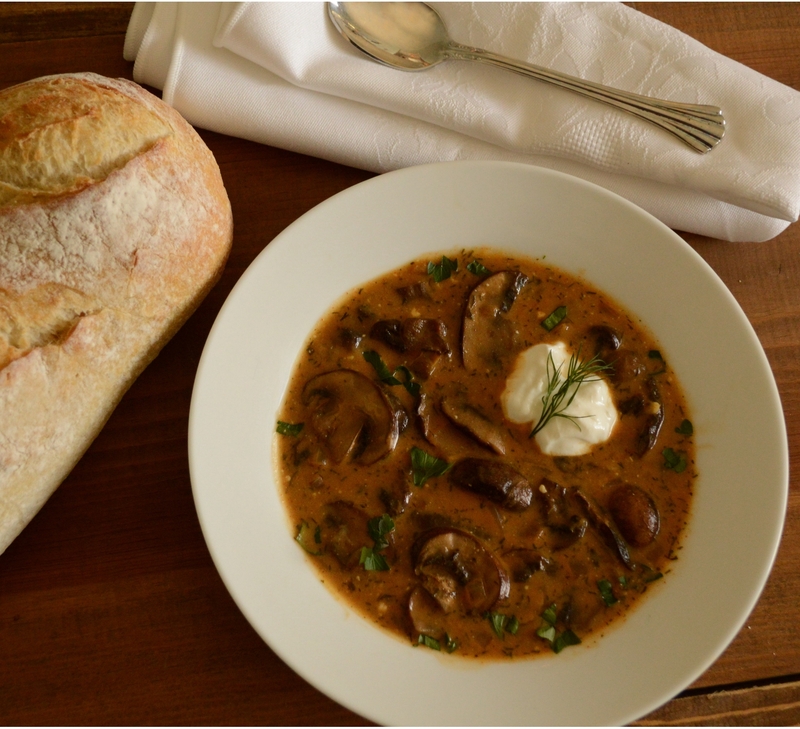 The possibilities are endless but one thing’s for sure, Mollie Katzen’s Hungarian Mushroom Soup does not disappoint. Keeper status for sure! I can’t wait to make this for my grandmother. In a Dutch oven or small soup pot sauté onion in 2 tablespoons of the butter until onions are clear. Next add mushrooms, tamari, paprika, dill weed and 1/2 cup of chicken stock. Cover and simmer for 15 minutes. Meanwhile, make a Bechamel. In small sauce pan melt 2 tablespoons butter. Whisk in 3 tablespoons flour and cook for several minutes. Next add milk. Cook, stirring frequently for about 5 minutes until mixture thickens. Stir into mushroom mixture and add remaining 1 1/2 cups of chicken stock. Cover and simmer for 15 more minutes. Just before serving add lemon juice, sour cream, salt and pepper. (Note: Soup should only be gently heated once sour cream has been added, do not boil after this point). Mollie Katzen’s Moosewood Cookbook is a real joy. I spent most of the spring happily cooking my way through her first chapter dedicated to soups. Chapter one is so complete that she subdivides it into two parts: Hot & Cold. Yum! Who knew that an over-sized package of Baby Bella mushrooms from Costco would lead me to such a treasure? The hand drawn illustrations are personal and the recipes… Well, let’s just say vegetables have never tasted so good. Mollie Katzen makes vegetables take center stage. Each dish shines with her knowledgeable use of herbs and knack for using vegetables in ways that you did not know were possible. 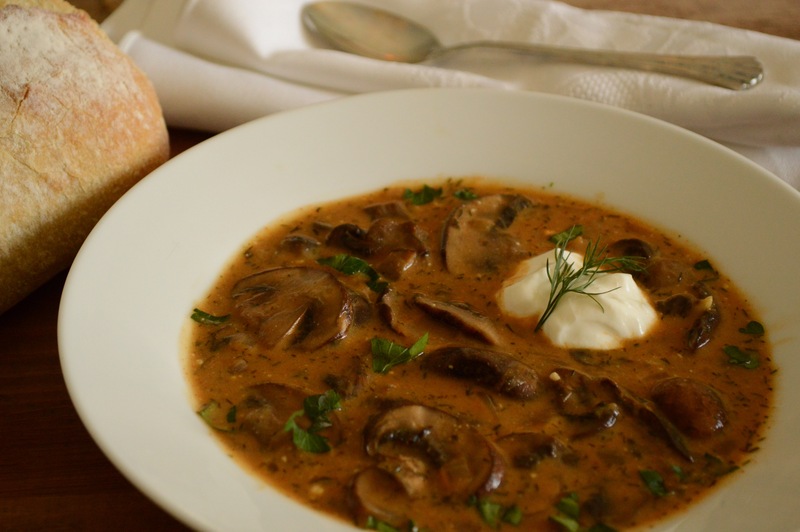 Although Hungarian Mushroom Soup might be my favorite, my 5-year-old would disagree. He loves her Cream of Asparagus. And then there is her Potato-Fennel, and Cauliflower Cheese or Mushroom Bisque. I could go on and on. And I will by placing a subtle hint for my husband hidden in this post. I would love a vintage copy of her original Moosewood Cookbook first published in 1977. The new one is great but the original version would be so lovely on my cookbook shelf. Ah Sue this is SO GOOD. Thank you Lynne. The story’s been simmering for awhile and many bowls of soup have been enjoyed. Oh, I love this post! Beautifully written! I can relate to: “… children bring perspective. They also bring laughter and so many Legos.” Many Legos, but I wouldn’t have it any other way. :0) This recipe looks delicious. I can’t wait to try it. Sue, I love your blog! I am impressed with your specialized recipes and beautiful narration about your cooking inspiration! I have already shared some of your recipes on my facebook. 🙂 I am already looking forward to your next scrumptious food tales and secrets! Reading this inspires even ME to get creative in the kitchen! And now I want soup!